Over the last year, I have been fortunate to visit 10 different countries on business. The experience and learnings I captured during each trip are tremendously valuable. I have been writing specific work reports, and I have also decided to share broader observations about each market. This is my media watch, starting with South Korea where I am spending the week. I will then backfill with India, Brasil, Singapore, Indonesia, Mexico, Australia, France..
Media Spend: Mobile ad spend is said to account for 10-15% of total ad spend in 2015 and as much as 29% by 2019. 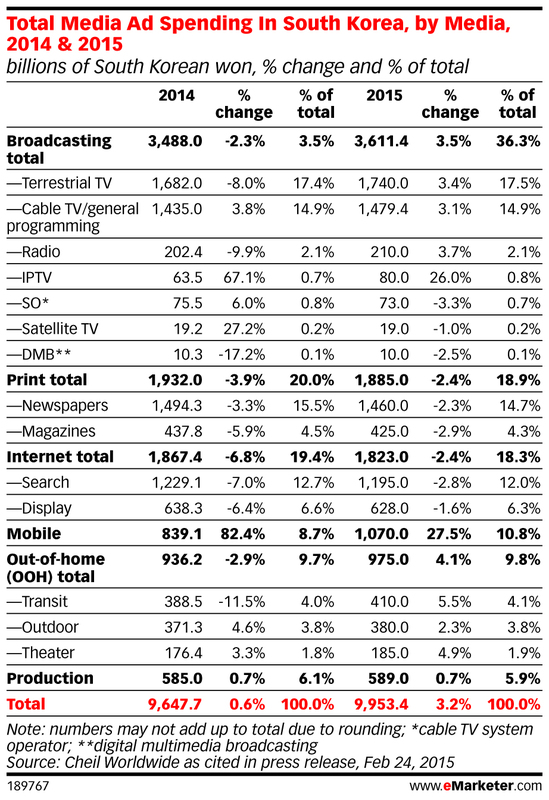 IPTV & Mobile represent the strongest growth. This demonstrates the power of fast mobile network accessible anywhere (when everyone watches mobile on their phone in the subway: commute time is the new prime time). 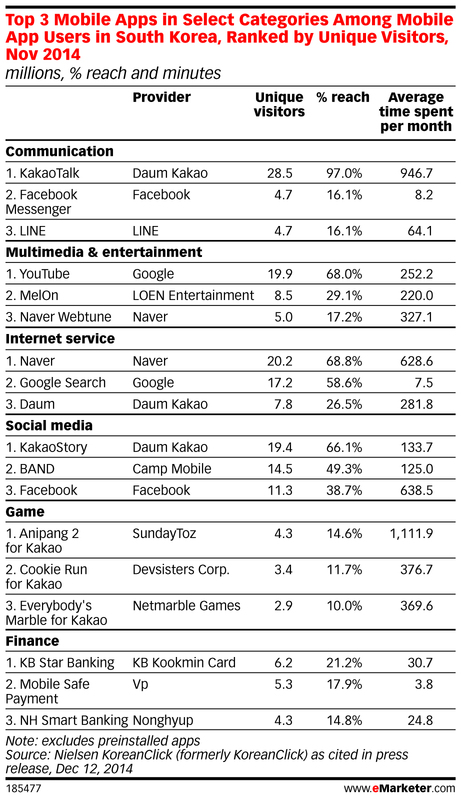 Mobile leaders: Google and Facebook are strongly represented, yet they are being crushed by the regional giants Daum Kakao and Naver. Opportunities for international companies: South Korea is well connected and extremely competitive. The lessons learnt by observing the dynamics can be very valuable (Kakao’s vertical integration is fascinating. Although described as a messaging service it also offers e commerce, content curation, taxi services…). South Korea is a great benchmark. Barriers for international companies: Language. Personal observation: This is the most competitive market I have ever seen with local player being extremely advance + vertical integration like nowhere else. Fun fact: #KPOP is everywhere. Travel tips: Traveling to Korea is like stepping into the future. Traveled there a few times and already impressed how fast interenet could be. Totally agree that language is big barrier for market entry, but also I think Korea (and other East Asian countries) has very distinctive culture and history, providing a product that is easy for locals to use and make locals like to use are also the key to success. 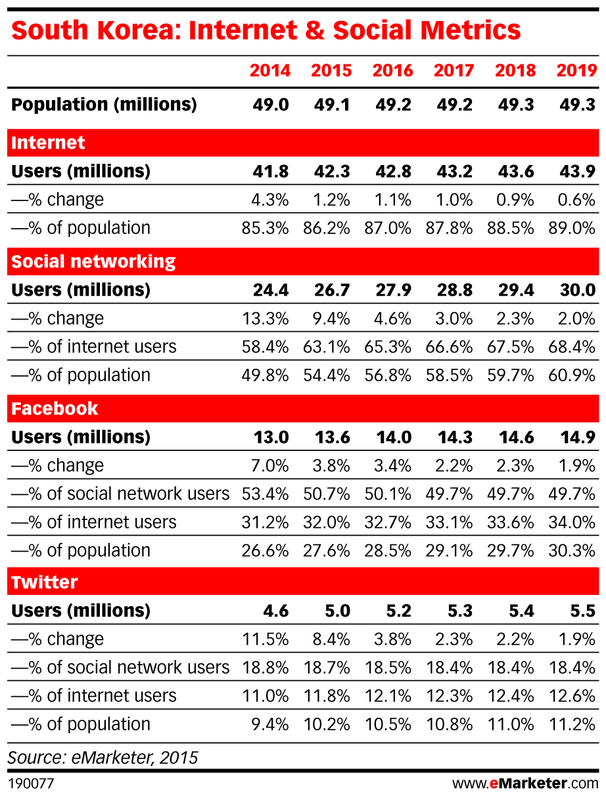 Not particularly surprise to see almost all top mobile app providers are local companies.